This is an old Neva treadle machine that my neighbours bought me for my birthday last year, it does work, though I have to find some new needles for it. I love it, it needs a little tlc but it is a stunning piece of machinery. They bought it at a second hand market and knew that I would love it. 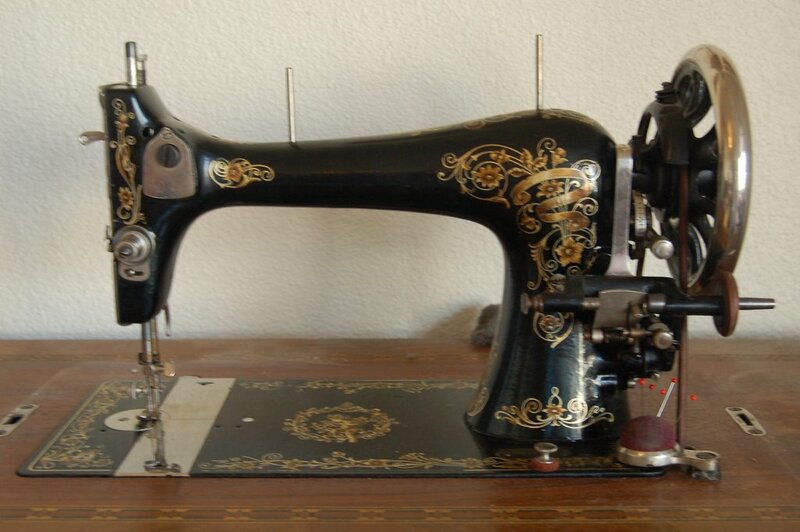 My love of sewing began when I started to sew clothes when I was 14 years old. I had spent a year nagging, convincing my Mum that it was a good idea for me to get a sewing machine for christmas. She on the other had really thought it would be a phase and it would be an expensive ornament. I used that same machine each week for 18 years, then I traded it in for a new model, which I have to say I don’t love in the same way. 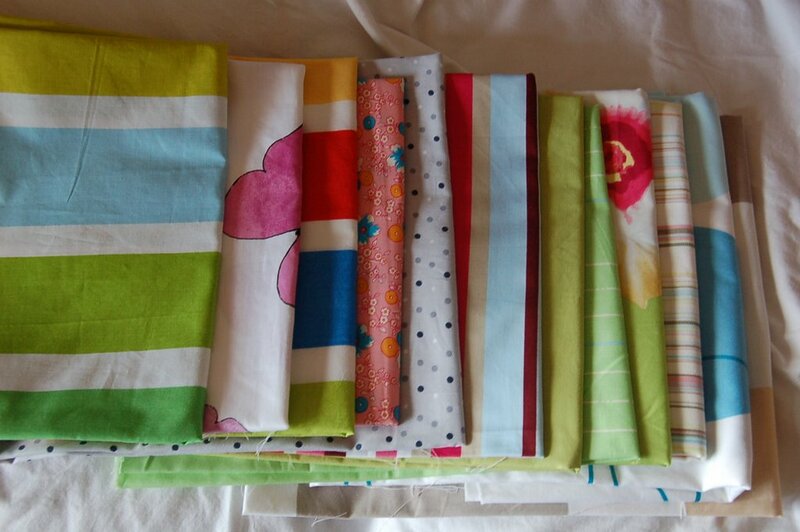 When I was 15 I started to work in a fabric shop at the weekend, then the fabric obsession really started. I have a HUGE amount of fabric in this tiny apartment, some of which does indeed date back some twenty-odd years. Every time we move house I get more and more ruthless about what I throw away but that doesn’t mean I stop buying new fabrics and therein lies the problem. September I did really well and bought no fabric, this of course means I just didn’t go anywhere that sold fabric, easy. October I had a few lessons to give to my friends two girls, one of which was learning about types of fabric and buying fabrics for specific projects. 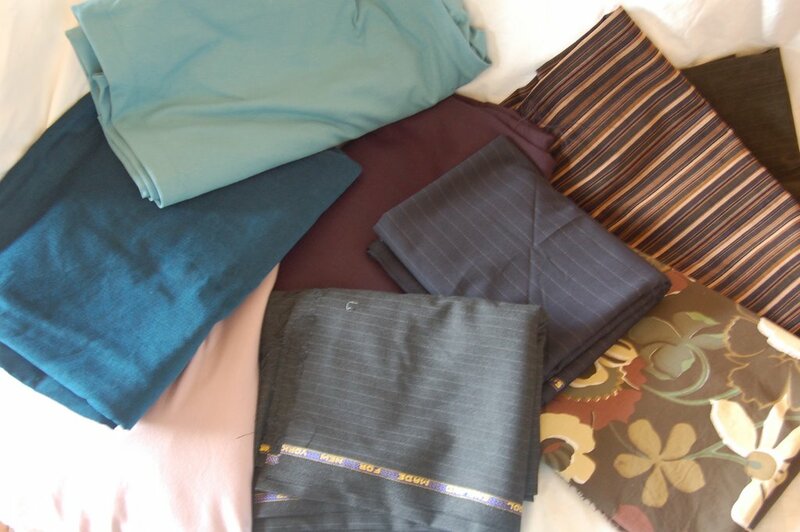 This of course meant visiting all the fabric shops in Grenoble, there are quite a few. So of course we are into a new season and new fabrics are out, new fashion and someone has new shoes that NEED new trousers. So 1m of some nice wool mix came home, thats okay it will soon be a pair of trousers it doesn’t even need to make it into the chest, no problem, right. 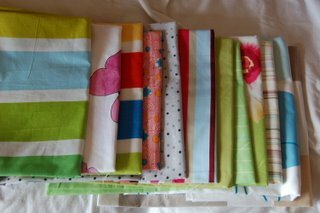 Then one of the girls need to find a specific fabric, not to be found in any shop, so we head off to search the markets, bingo, found the fabric she wanted, perfect. Problem being I also found some english wool in pinstripe, gray and navy, a gorgeous cotton jersey in 2 perfect colours, 2m of needlecord and they were so cheap, they had to come home with me. So now we have to do a little bit of re-organising of the chest a little bit of squishing the lid down, yeah I know it bounces a bit when you sit on it now, just don’t sit on it and no-one will notice. One of the girls has gone off to do some volunteer work in Africa, one of the things we made before she left was a little drawstring backpack. Her Mum called me the other day to see if I would pick up some cottons for her to take over there to show some kids how to make these bags, sure, making a trip to the remnant shop is never a problem. So I picked up lots of small pieces for her and was very pleased with my purchases. Except these came home with me too, pinstripe velvet, stripy needlecord and a floral cotton lining, now if only there were a lot more hours in each day I would be fine. Today I have to buy the ribbon for my tank, the only place that sells velvet ribbon is the poshest fabric shop in town, so I promise not to look and not to buy any fabric when I am there, okay, wish me luck. It’s a bit mean, isn’t it, denying myself cupcakes for the pleasure of essay writing? Hi Yvette, I really like your treadle machine! I have one too. 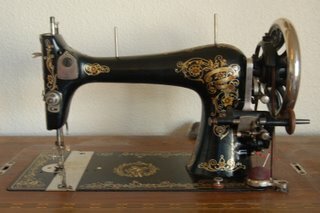 It’s a Seamstress Rotary and it was a gift from a friend because I looked after her daughter for a summer. When you open the cover, there’s a chain which pulls the machine up. It works well and I love it. I think we should treasure these old machines. No one makes them like that anymore.